This CD contains all of Bach's non-organ keyboard work as well as all the 4-part chorales. 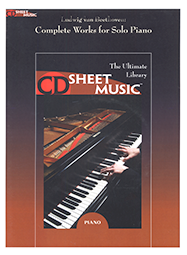 Included are all the Two and Three Part Inventions, Well-Tempered Klavier, Goldberg Variations, all the suites, Italian Concerto, and notebooks of easier pieces - over 1100 pages of music. Johann Sebastian Bach was born in Eisenach, Germany, in 1685 and died in Leipzig, Germany, in 1750.